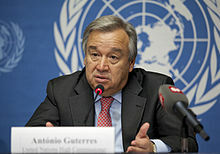 António Manuel de Oliveira Guterres (born 30 April 1949) is a former Prime Minister of Portugal (from 1995 to 2002) and United Nations High Commissioner for Refugees (from June 2005 to December 2015), and the next United Nations Secretary General (elected in October 2016). We can't deter people fleeing for their lives. They will come. The choice we have is how well we manage their arrival, and how humanely. The dramatic problems of today's complex world can only inspire a humble approach. Throughout his career, Mr. Guterres has proven himself to be an advocate for human rights and a champion for the most vulnerable. As UN High Commissioner for Refugees, he provided help and hope to millions of men, women and children who have been forced to flee from their homes. And he is a consensus-builder who can bring people together to advance common interests and address common challenges. I was heartened that Mr. Guterres indicated that gender equality will be a top priority when filling senior positions. We have every confidence that, as a former prime minister of Portugal and U.N. High Commissioner for Refugees, Mr. Guterres has the character, vision and skills needed to lead the United Nations at this critical moment. This page was last edited on 20 April 2018, at 20:31.